The EUSALP objectives highlight cross-cutting policy areas and especially governance. Action Group 8 therefore carried out a status quo analysis of risk governance in the field of natural hazard management. 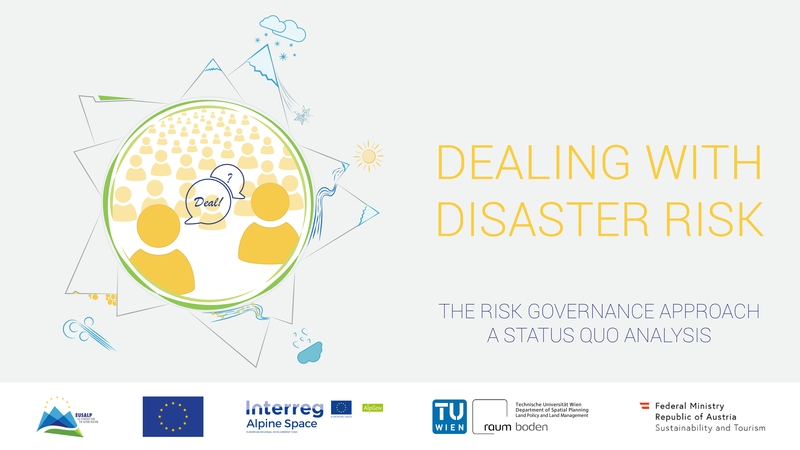 With the support of TU Wien the group members investigated the existing national regulatory frameworks in hazard management and mapped governance mechanisms that are already in place in a comparable manner. In a close cooperation with the Alpine Convention good practice examples were collected. Finally, Action Group 8 identified and formulated recommendations for enhancing risk governance mechanisms concerning the management of natural hazards in the Alps. A final report on Natural Hazard Risk Governance is available in English and will be accomplished by a policy brief (engl./german) in 05/2019.